A ship’s graveyard lies just off the northeast tip of lower Michigan’s Thumb District, within sight of the old lighthouse at Lake Huron’s Pointe aux Barques. When the weather is good sport divers like to visit some of the better known wrecks, all lying within a few miles of one another. But they are deep dives, many of them up to 150 feet down, and only the most experienced divers dare to visit them. Among the wrecks is the Iron Chief, a 212-foot wooden-hulled steamer that met its fate on October 3, 1904. Built as a schooner 23-years earlier in Detroit, the Iron Chief was later converted to be a steam barge. She never lost the grace she had as a sailing ship and she carried her four masts until she went to the bottom. The Iron Chief’s final trip into Lake Huron began with Captain U.S. Cody at the helm, and the barge Iron Cliff in tow. Both vessels were laden with coal, bound from Port Huron north to Duluth. When they ran into rough weather on Lake Huron Captain Cody wasn’t concerned. The Iron Chief was an old boat, but she had weathered this kind of a sea before. What Cody didn’t expect, however, was that his command was about to develop a serious problem. The trouble began when the stern pipe, sometimes called a stuffing box located where the propeller shaft passes through the hull, failed and the boat took on a serious leak. Chief Engineer Charles Steadman and other crew members made a dramatic effort from inside the hull to seal the leak but they were unsuccessful. It was not long before they were driven from the stern and soon the engine room as the water gained. When the boiler fire was extinguished the old steamer was adrift in a storm without power. The crew of the Iron Cliff cut the towline and set sail for Alpena. 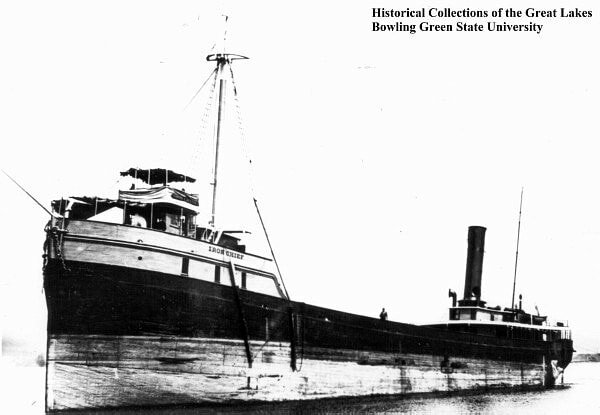 Because of the heavy seas the barge was unable to turn around and pull alongside the sinking steamer and take off the crew. The steamer Andrew Carnegie came upon the sinking vessel at about 11 p.m. Capt. John McArthur of Port Huron, master of the Carnegie, shot a towline to the Iron Chief and attempted to pull it into Harbor Beach harbor. Progress was slow as the two vessels battled the storm. By about seven o’clock the next morning, as the boats were off Pointe aux Barques, the Iron Chief went down. When it was known the boat could not be saved McArthur pulled is steamer alongside the stricken barge and safely removed the crew of 13 sailors. Divers say the Iron Chief broke up when it struck bottom stern first. The wooden superstructure broke free and floated away. The sides of the hull buckled and exploded outward. The decks were torn apart and parts of the old ship were tossed in all directions. The cargo of coal lies in a pile on the lake floor with ribs of the old ship sticking up through it. The Iron Chief’s anchor was raised by divers and is on display at the Grice Museum at Harbor Beach.